dalle 8.30 alle 19.00 e il sabato dalle 8.30 alle 12.30. Estap Elektrik Elektronik ve Bilgisayar Sistemleri San. ve Tic. A.Ş. This Terms of Service (this “TOS”) is a legally binding agreement made by and between Cablofil UK Ltd. (“Cablofil”) and you, personally and, if applicable, on behalf of the entity for whom you are using this web site (collectively, “you”). This TOS governs your use of the Cablofil web site (the “Web Site”), so please read it carefully. INTERNET TECHNOLOGY AND THE APPLICABLE LAWS, RULES, AND REGULATIONS CHANGE FREQUENTLY. ACCORDINGLY, CABLOFIL RESERVES THE RIGHT TO MAKE CHANGES TO THIS TOS AT ANY TIME. YOUR CONTINUED USE OF THE WEB SITE CONSTITUTES ASSENT TO ANY NEW OR MODIFIED PROVISION OF THIS TOS THAT MAY BE POSTED ON THE WEB SITE. (a) Eligibility. Except as expressly provided below, the Web Site may only be used by individuals and entities who can form legally binding contracts under applicable law. (b) License and Restrictions. Subject to the terms and conditions of this TOS, you are hereby granted a limited, non-exclusive right to use the content and materials on our Web Site in the normal course of your use of the Web Site. You may not use any third-party intellectual property without the express written permission of the applicable third party, except as permitted by law. Cablofil will retain ownership of its intellectual property rights and you may not obtain any rights therein by virtue of this TOS or otherwise, except as expressly set forth in this TOS. You will have no right to use, copy, display, perform, create derivative works from, distribute, have distributed, transmit or sublicense from materials or content available on the Web Site, except as expressly set forth in this TOS or License. (c) Prohibited Conduct. In your use of the Web Site, you may not: (i) infringe any patent, trademark, trade secret, copyright, right of publicity or other right of any party; (ii) disrupt or interfere with the security or use of the Web Site, the Web Site or any web sites linked to the Web Site; (iii) interfere with or damage the Web Site, including, without limitation, through the use of viruses, cancel bots, Trojan horses, harmful code, flood pings, denial of service attacks, packet or IP spoofing, forged routing or electronic mail address information, or similar methods or technology; (iv) impersonate another person or entity, misrepresent your affiliation with a person or entity, including (without limitation) Cablofil, or use a false identity; (v) attempt to obtain unauthorized access to the Web Site; (vi) engage, directly or indirectly, in transmission of “spam,” chain letters, junk mail or any other type of unsolicited solicitation; (vii) collect, manually or through an automatic process, information about other users without their express consent or other information relating to the Web Site; (viii) submit false or misleading information to Cablofil; (ix) engage in any activity that interferes with any third party’s ability to use or enjoy the Web Site; or (x) assist any third party in engaging in any activity prohibited by this TOS. (a) Cablofil provides information about its products (“Products”) on the Web Site (such information, “Product Information”). While Cablofil attempts to ensure that the Product Information is complete and accurate, it may contain typographical errors, pricing errors, and other errors or inaccuracies. Cablofil assumes no responsibility for such errors and omissions, and reserve the right to: (i) revoke any representation on the Web Site; (ii) correct any errors, inaccuracies or omissions; and (iii) make changes to prices, content, promotions, product descriptions or specifications, or other information on the Web Site. (b) Cablofil tries to display Products as accurately as possible on the Web Site. However, because Product images are dependent on your hardware and software, Cablofil cannot guarantee that the images of the Products accurately depict the Products. (c) All Product sales are subject to Cablofil’s standard terms of sale (“Terms”), and nothing in this TOS or on the Web Site will be deemed to modify, waive, or supplement the Terms. (a) Copyright. All materials on the Web Site, including without limitation, the logos, photographs, design, text, graphics, other files, and the selection and arrangement thereof are either owned by Cablofil or are the property of Cablofil’s suppliers or licensors. You may not use such materials without permission. © 2005 Cablofil, Inc. ALL RIGHTS RESERVED. (b) Trademarks. Cablofil® and the related design marks, and other trademarks on the Web Site are owned by Cablofil, or its suppliers or licensors. Page headers, custom graphics, button icons and scripts are trademarks or trade dress of Cablofil. You may not use any of these trademarks, trade dress, or trade names without the express written permission of Cablofil. 5. Linking and Framing. You may not deep link to portions of the Web Site; or frame, inline link, or similarly display any Cablofil property, including, without limitation, the Web Site. You may not use any Cablofil logo or other of its trademarks as part of a link without express written permission. 6. Indemnification. You agree to hold Cablofil and its employees, representatives, agents, attorneys, affiliates, directors, employees, officers, managers and shareholders (the “Indemnified Parties”) harmless from any damage, loss, cost or expense (including without limitation, attorneys’ fees and costs) incurred in connection with any third-party claim, demand or action (“Claim”) brought or asserted against any of the Indemnified Parties: (i) alleging facts or circumstances that would constitute a breach of any provision of this TOS by you or (ii) arising from, related to, or connected with your use of the Web Site. If you are obligated to provide indemnification pursuant to this provision, Cablofil may, in its sole and absolute discretion, control the disposition of any Claim at your sole cost and expense. Without limitation of the foregoing, you may not settle, compromise or in any other manner dispose of any Claim without the consent of Cablofil. 7. Comments. All comments, feedback, suggestions, ideas, and other submissions that you disclose, submit or offer to Cablofil in connection with your use of the Web Site (collectively, “Comments”) will become Cablofil’s exclusive property. Such disclosure, submission or offer of any Comments shall constitute an assignment to Cablofil of all worldwide right, title and interest in all patent, copyright, trademark, and all other intellectual property and other rights whatsoever in and to the Comments and a waiver of any claim based on moral rights, unfair competition, breach of implied contract, breach of confidentiality, and any other legal theory relating to submissions. Thus, Cablofil will own exclusively all such right, title and interest and shall not be limited in any way in the use, commercial or otherwise, of any Comments. You should not submit any Comments if you do not wish to assign such rights to Cablofil. Cablofil is and will be under no obligation: (i) to maintain any Comments in confidence; (ii) to pay to you or any third party any compensation for any Comments; or (iii) to respond to any Comments. You are and shall remain solely responsible for the content of any Comments you make. 8. DISCLAIMERS, EXCLUSIONS AND LIMITATIONS. (a) DISCLAIMER OF WARRANTIES. 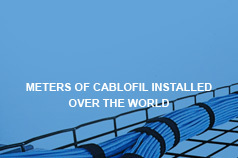 CABLOFIL PROVIDES THE WEB SITE ON AN “AS IS” AND “AS AVAILABLE” BASIS. CABLOFIL DOES NOT REPRESENT OR WARRANT THAT THE WEB SITE, ITS USE, OR ANY INFORMATION ON IT: (I) WILL BE UNINTERRUPTED OR SECURE, (II) WILL BE FREE OF DEFECTS, INACCURACIES OR ERRORS, (III) WILL MEET YOUR REQUIREMENTS, OR (IV) WILL OPERATE IN THE CONFIGURATION OR WITH OTHER HARDWARE OR SOFTWARE YOU USE. CABLOFIL MAKES NO WARRANTIES OTHER THAN THOSE MADE EXPRESSLY IN THIS TOS, AND HEREBY DISCLAIMS ANY AND ALL IMPLIED WARRANTIES, INCLUDING WITHOUT LIMITATION, WARRANTIES OF FITNESS FOR A PARTICULAR PURPOSE, MERCHANTABILITY AND NON-INFRINGEMENT. (b) NO WARRANTIES AS TO PRODUCTS. IN PROVIDING THE PRODUCT INFORMATION ON THE WEB SITE, CABLOFIL MAKES NO WARRANTIES, EXPRESS OR IMPLIED, WITH RESPECT TO THE PRODUCTS INCLUDING, WITHOUT LIMITATION, WARRANTIES OF FITNESS FOR A PARTICULAR PURPOSE, MERCHANTABILITY, OR NON-INFRINGEMENT. ALL WARRANTIES APPLICABLE TO THE PRODUCTS ARE SET FORTH IN THE TERMS. (c) EXCLUSION OF DAMAGES. CABLOFIL WILL NOT BE LIABLE TO YOU OR ANY THIRD PARTY FOR ANY CONSEQUENTIAL, INCIDENTAL, INDIRECT, PUNITIVE OR SPECIAL DAMAGES (INCLUDING DAMAGES RELATING TO LOST PROFITS, LOST DATA OR LOSS OF GOODWILL) ARISING OUT OF, RELATING TO OR CONNECTED WITH THE USE OF THE WEB SITE, BASED ON ANY CAUSE OF ACTION, EVEN IF ADVISED OF THE POSSIBILITY OF SUCH DAMAGES. (d) LIMITATION OF LIABILITY. IN NO EVENT WILL THE AGGREGATE LIABILITY OF CABLOFIL ARISING FROM, RELATING TO, OR IN CONNECTION WITH THIS TOS OR THE WEB SITE EXCEED $100. 9. Force Majeure. Cablofil will not be liable for failing to perform under this TOS by the occurrence of any event beyond its reasonable control, including, without limitation, a labor disturbance, an Internet outage or interruption of service, a communications outage, failure by a service provider to Cablofil to perform, fire, terrorism, natural disaster or war. 10. Limitation of Actions. You acknowledge and agree that, regardless of any statute or law to the contrary, any claim or cause of action you may have arising out of, relating to, or connected with your use of the Web Site, must be filed within one calendar year after such claim or cause of action arises, or forever be barred. 11. Changes to the Web Site. Cablofil may, in its sole discretion, change, modify, suspend, make improvements to or discontinue any aspect of the Web Site, temporarily or permanently, at any time without notice to you, and Cablofil will not be liable for doing so. 12. Termination. Cablofil will have the right to terminate your access to the Web Site if it reasonably believes you have breached any of the terms and conditions of this TOS. Following termination, you will not be permitted to use the Web Site. If your access to the Web Site is terminated, Cablofil reserves the right to exercise whatever means it deems necessary to prevent unauthorized access to the Web Site, including, but not limited to, technological barriers, IP mapping, and direct contact with your Internet Service Provider. This TOS will survive indefinitely unless and until Cablofil chooses to terminate them, regardless of whether you have the right to access or use the Web Site. 13. Integration. This TOS contain the entire understanding of the you and Cablofil regarding you and Cablofil regarding the use of the Web Site, and supersedes all prior and contemporaneous agreements and understandings between you and Cablofil regarding the use of the Web Site.